Another hermit thrush recently spent several days foraging in our yard. True to its common name, this bird was very shy and retiring. For a week I tried to photograph the thrush with no success. I could watch the hermit thrush from inside the house as it hopped and scraped in the leaf litter looking for insects. As soon as I stepped outside the thrush flew off. I camouflaged myself and sat quietly near where the thrush was feeding and it would not appear , but returned to feed before I was barely back into the house. This cat and mouse game went on for days before the hermit thrush disappeared. Hermit thrushes are short distance migrators that summer throughout most of Canada, Western United States, the Great Lakes region and Northeast United States and winter near the West Coast and in the Southern States and parts of Mexico. Our visitor was probably on its way to a warmer climate for the winter. After spending so many fruitless hours stalking the hermit thrush I am determined to post a picture of this elusive visitor, even though it is a poor picture taken at an angle through a double pane window. 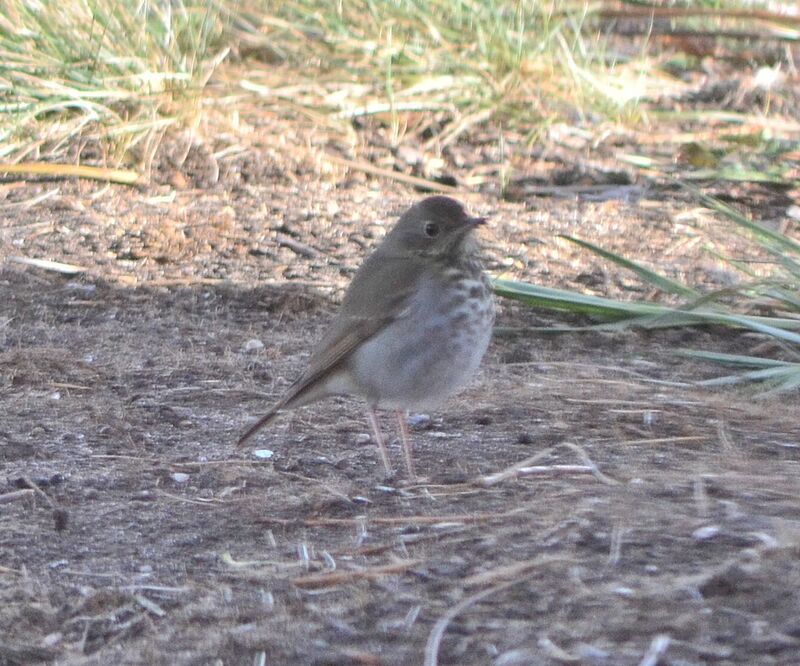 This entry was posted in Birds and tagged Catharus guttatus, hermit thrush, nature photography. Bookmark the permalink.